Do I have a love for pizza? Yes, yes I do. Which brings me to Levetto on Sudbury! A small venue with a trendy interior and eats for all. It's got long tables for seating, so go up to the counter, place your order and grab a seat. Don't forget your drink at the counter!!! We sat down and waited. We had made a reservation, so they knew we were coming. We had a group of about 15 AND it was busy, but half of the food arrived and then the rest about 15min later. It was a kind of awkward. Luckily, some ordered more than 1 item, so they didn't starve. Everyone who ordered pasta raved and enthusiastically tried to share with everyone because the portion was so big and they had ordered pizza too. When the gal from Italy says it's good pasta, it's good pasta. For pizza, I ordered the Pollo Tuscano. A perfect size for 1 person. 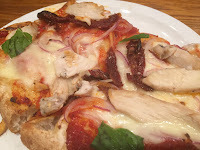 It had chicken, sundried tomatoes, tomato pesto, red onion and fresh basil. The toppings were fresh and tasty, very flavourful. The star here was the crust. So buttery, fluffy and crispy. Out of all of the pizza places I've been, this crust is my favourite. Someone gave me a slice of their Patate pizza. I'd never had pizza like it. 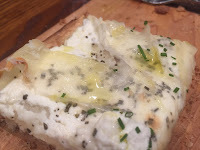 It had thinly sliced potato, white truffle oil, ricotta cheese, rosemary and green onion. I expected it to be heavy because there was potato and ricotta, but it wasn't. It was OK. It wasn't as flavourful as I'm used to, but I'd never had a white pizza before. I'm told as far as white pizza standards go, this one was pretty awesome. An added bonus to us checking in on Yelp, gave us free dessert! WOO! I got the Warm Brown Butter & Coconut Cake. It was covered in pistachios and coconut icing. It was small, but you couldn't finish it. Many of us were sharing desserts because they were so rich. 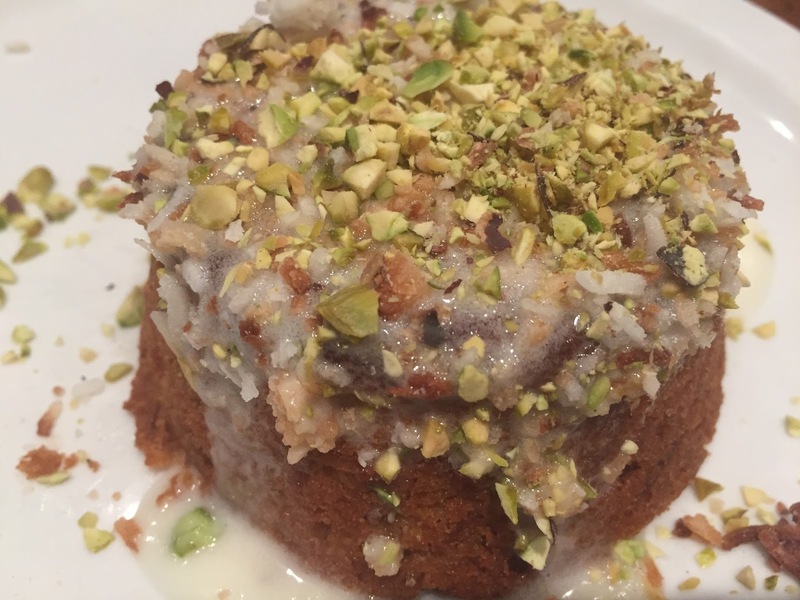 The cake was moist and had just the right amount of coconut. About halfway through the cake, I was done. It became too sweet, but it was a nice finish to the savoury pizza. My favourite pizza so far! Wish I lived closer so I could pick some up.